As part of a course on business model innovation, IFI students got the chance to see the innovation process of Johammer Mobility GmbH at first hand. The company which is located in Bad Leonfelden, Upper Austria is highly innovative despite its small size. 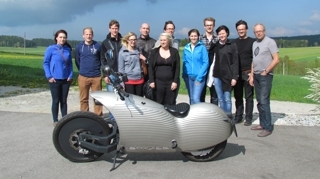 Currently its newly developed all-electric motorcycle revolution – the Johammer J1 is entering the market. Students from the IFI Institute of Innovation Management were seemingly impressed by the innovative capability of the firm.